It’s been ninety years since ski jumping became an Olympic sport. Today was the first time women could compete. 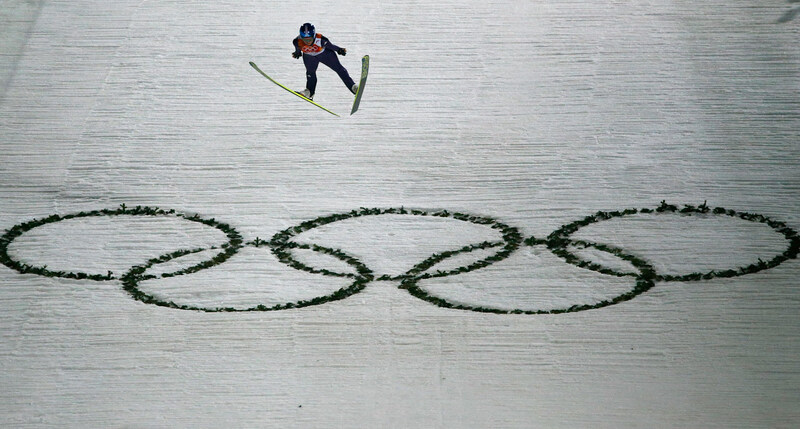 Women competed in the ski jump for the first time at a Winter Olympics on Tuesday. So far, their uteruses seem to be intact. He was referring to the pseudo-scientific belief that repeated impacts could dislodge female reproductive organs. “I’ve had people ask me had my uterus fallen out yet,” American ski jumper Lindsey Van, who has been at the forefront of the fight for inclusion, famously said about such claims. Others have argued that because of the different structure of male and female legs, women ski jumpers face greater wear and tear on their knees. But don’t most Winter Olympic sports feature pretty significant risk of injury for their competitors? Even as the women’s ski jumping was starting up, snowboarders were fighting slushy snow on a steep half-pipe, almost all of them falling at least once and some coming close to crushing themselves on the lip. At the ski jump, German jumper Carina Vogt, who has never won a world cup event, surprised by taking gold with jumps of 103 meters and 97.5 meters. Austrian Daniela Iraschko-Stolz won silver, becoming the second openly gay athlete after Dutch speed skater Ireen Wüst to medal at these Olympics, which of course are taking place in a country that recently adopted a law against gay propaganda among minors. “I’m married to a woman. It’s a good statement, especially in Russia, to show that people can live together,” Iraschko-Stolz said at a press conference following her win. Coline Mattel of France won the bronze. But the true milestone here was of course the inclusion of women’s ski jumping, which makes these the first Winter Games where both genders can compete in every sport. The victory was a long time in the making. As far back as the 1920s, female Canadian ski jumper Isabel Coursier was developing the relatively young sport, setting a world record in 1922 with a 25.6 meter jump in British Columbia. But at competitions, women were often relegated to testing out the jumps for their male counterparts, and it wasn’t until 1999 that the FIS held its first women’s ski jumping contest. The first women’s world championships were held in 2009 and the first World Cup season in 2011–12. “It’s the most important step for women’s ski jumping to get to the Olympics, because it’s the highest level winter sport can reach,” Iraschko-Stolz said on Tuesday. Since 1998, the International Olympic Committee, which no one has ever accused of being progressive, denied them every time. In 2009, Van and fourteen other ski jumpers sued the Vancouver Organizing Committee to be included in the 2010 Winter Olympics, arguing that the failure to stage equal skiing events for women would violate Section 15 of the Canadian Charter of Rights and Freedoms. The British Columbia Supreme Court, however, while admitting the inequality existed, said it fell under the jurisdiction of the IOC rather than the charter. Finally in 2011, that old boys’ club the IOC grumblingly announced that women’s ski jumping would be held at the Sochi Games. The atmosphere at the inaugural competition on Tuesday, where stands were hardly full (they haven’t been for many events), might not have been as charged as when Jesse Owens discredited the idea of Aryan superiority with four gold medals at the 1936 Berlin Olympics, or when Tommie Smith and John Carlos protested discrimination at the 1968 Olympics in Mexico City. But it marked the fall of another barrier and the inclusion of women in all sports in the Winter Olympics. Nonetheless, the struggle continues: Men still outnumber women at summer and winter Olympics, and while female ski jumpers compete in one event at Sochi, male jumpers are competing in three.